The inverted coaster is a trend that began in the mid 90’s and has grown to become one of the most popular coaster styles of the world. Riders are situated below the track with the chasis located directly above their heads, leaving nothing. Feet dangle over nothing but air as a train disembarks from the catwalks of the lift hill and into the beginnings of an adventure. The originators of the modern inverted coaster is Swiss roller coaster manufacturer, Bolliger & Mabillard. With more than 30 inverted coasters across the globe, it has proven to be their most successful coaster model. Perhaps it is the sense of freedom riders experience while the wind flows through their toes, or the more open view that cannot be offered on a traditional coaster, or maybe even a combination of these elements that have contributed to the model’s success. Over the years, a wide variety of inverted coasters have been constructed across the globe; some of these ‘inverts’ are great, while others are just okay. Today we have the cream of the crop, as we present you with the Park Thoughts’ Top 5 Inverted Coasters. 5. Alpengeist at Busch Gardens Williamsburg – The tallest and fastest of all the B&M inverts is Alpengeist at Busch Gardens Williamsburg. Riders board their ‘ski lift’ and climb nearly 200 feet before a 270 degree turning 170 foot drop. Unlike most inverted coasters that begin with a loop, Alpengeist starts with an enormous Immelmann element. The ski lift then swirls into a loop, followed by a cobra roll and spirals upward into a mid course break run. The unique arrangement of elements continues with a zero-g roll after the mid course break run, one more corkscrew and a couple of turns before coasting into the final break run, totaling 6 inversions. While Alpengeist is huge, it’s also known for being one of the most rough inverted coasters as well; the rattling of riders head’s against the restraints is certainly not an appealing experience. And while the coaster has a nicely themed station, on the ride it is quite spotty, especially towards the end. Some sections directly below the track are covered in ‘snow’ while 4 feet away there is green grass. It’d almost make you wonder if it would be better to ditch the snow elements on the ride all together. Despite some of these downfalls, Alpengeist’s one of a kind layout lands it at the number 5 spot on our count down. 4. 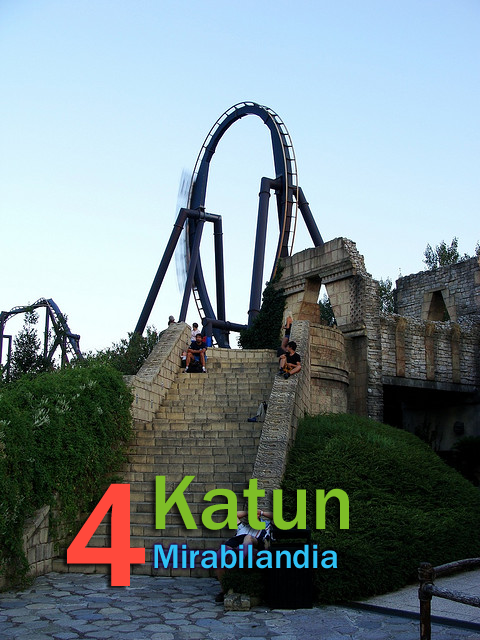 Katun at Mirabilandia – Another giant inverted B&M master piece was built by the Italians; Mirabiilandia’s Katun tops out at 165 feet, before dropping 148 feet into a vertical loop. Immediately after the loop is a tall zero-g roll followed by a very hard banked turn into a cobra roll. The train then helices upward into a mid course break run, dives downward once again and into back to back cobra rolls. Katun finishes off with a helix into a ‘stargate’. Themed to the Mayan Empire rider’s toes come just inches away from numerous ‘ruins’ including the stargates at the beginning and end of the coaster. Katun is a solid roller coaster, there is simply no denying it. However while it’s great at being a ‘standard’ B&M inverted coaster, it really suffers from lack of creativity. Katun is fairly short with an uninspired layout of loop, zero-g roll, cobra roll, corkscrew corkscrew. Katun’s sheer size does although make up for the lack of creativity. It’s not often that we see a nearly 150 foot straight drop on an inverted coaster. The combination of size and near perfect execution of elements places Katun at number 4. 3. 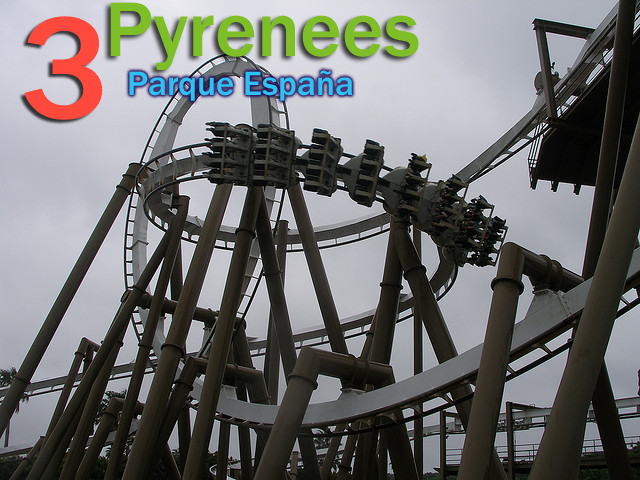 Pyrenees at Parque España – Yet another overseas master piece is Pyrenees at Parque España in Japan. The coaster could be considered as the god child of Cedar Point’s Raptor and the popular Batman: The Ride models at Six Flags parks across the nation. Beginning with a 148 foot climb, the ride then falls into a loop, zero-g roll, loop sandwich inverting riders 3 times back to back to back. After the ‘sandwich’ the train whips across a tight turn and into a cobra roll before spiraling upwards through the second loop and into the mid course break run. Riders then drop into a cobra roll, followed by a mini-overbank over the pull out of the first drop, an airtime hill and one more turn into the break run. Pyrenees is another great example of an extremely well executed inverted roller coaster by Bolliger & Mabillard. The ride is non-stop action packed with elements, one after another. Once again, the ride doesn’t have the most unique layout but it’s really really good at what it is supposed to be. The never letting Pyrenees coasts into the number 3 spot of the countdown. 2. 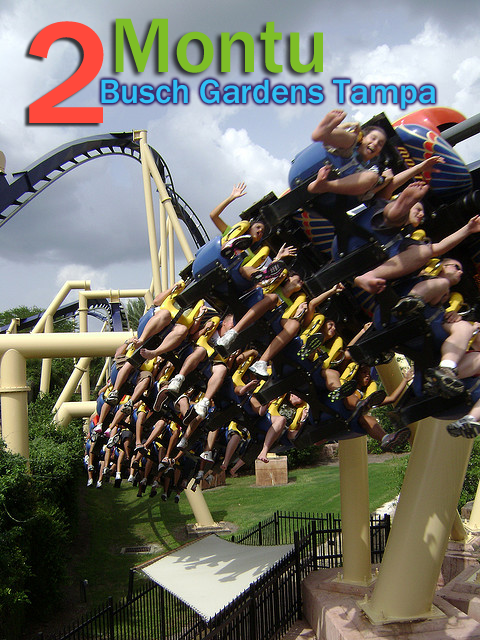 Montu at Busch Gardens Tampa Bay – Alpengeist’s older, and frankly, better brother at Busch Gardens Tampa is Montu. Topping out at 150 feet, the ride drops 130 into a 104 foot tall vertical loop. Riders whip through an immelmann and into a zero-g roll. Montu features a unique Batwing element that is similar to a reverse cobra roll which is featured on only one other inverted coaster on the planet. After a mid course break run, the invert makes a steep drop into a vertical loop, a couple of helices, a corkscrew and finally one turn into the finale break run. Montu totals 7 inversions over it’s nearly 4,000 feet of track. Not only does Montu feature some unique elements like the batwing, but the ride is also heavily themed. Named after the Egyptian god of war, Montu spends much of it’s course either near or below ground level diving through trenches and tunnels throughout he ride. With a highly themed station and queue, the ride is a beautiful blend between coaster and thematic elements. Unlike it’s cousin at Busch Gardens Willimsburg, Montu is smooth through each and every one of it’s many transitions. Montu while fantastic, is not quite good enough to win the title, capturing the number 2 spot on our countdown. 1. 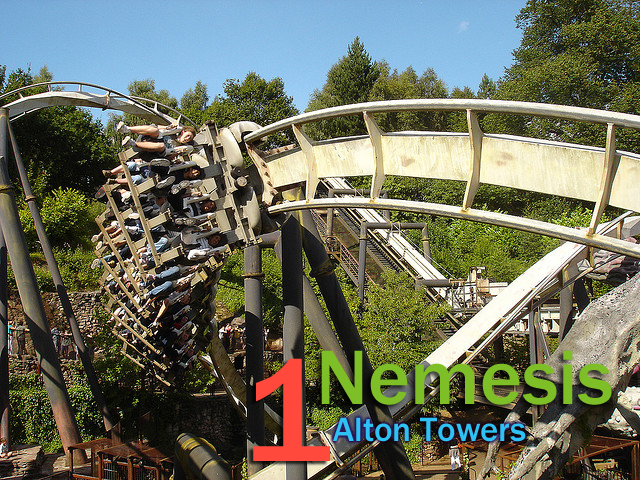 Nemesis at Alton Towers – Alton Towers was faced with a difficult task of creating a thrill machine that would satisfy the desires of coaster junkies and still be within the park’s strict height limit. The result was Nemesis, the world’s greatest inverted roller coaster. After climbing just 42 feet, the coaster immediately turns into what appears to be a gentle drop followed by a corkscrew. The train is thrashed into a wild 270 degree helix before jumping through a zero-g roll over the lift. Nemesis hurdles rides over a tight over bank turn and into a loop before spiraling upward, through a corkscrew, and one final turn into the break run. Nemesis is amazing. With such tight height constraints the park carved into the landscape by building ravines and ditches to have the coaster stay below the tree line. This eliminated the ability to start out with a steep drop into a loop like nearly all inverted coasters do and caused the designers to become much more creative with the ride. Not only is the ride’s layout truly one of a kind but it is intense! The turns on Nemesis are described as being the best of any B&M invert on the planet. Nemesis also features elaborate theming and landscaping such as alien creatures, blood rivers, and more. Nemesis is the perfect package of a unique layout, intense ride experience and thematic elements claiming the title as the number 1 inverted coaster on the planet! While these are the top 5 inverted coasters, there are several other great inverts out there as well. Honorable Mentions go to Batman: The Ride models at Six Flags parks, Raptor at Cedar Point, Afterburn at Carowinds, Black Mamba at Phantasialand, and Talon at Dorney Park. Inverted coasters are known for their tight turns and winding drops with feet flying high above, or in some cases low to the ground below. There popularity is not only possessed by parks, but clearly by riders by claiming top spots in several fan polls year after year. So as parks are gearing up to open, head out to a park near you because the odds are it, too, will have an inverted coaster. Have you been on one of these inverted coasters? Do you have your own Top 5? Leave a comment with your Park Thoughts below! Image Credits: Tyler Neu, Marcel ², David Morton, Kevin Cantor, Andrew Brown. All of these coasters are very intense, witch is why I they make it on my top 5. John, there is a reason we have “Thoughts” and “Reviews” as separate section. Thoughts are strictly our first impressions, our opinions our own perspective on a certain new ride. It by no means is indicative that we have ridden these rides. I, like most all theme park enthusiasts, have not been fortunate enough to travel the world. However with the internet, it has become increasingly easier to obtain reviews and videos from rides around the world. From these we can create our own thoughts and feelings towards a ride. Reviews, on the other hand are strictly for coasters we have ridden. Never, do I “Review” a ride I have never experienced first hand. I appreciate your honesty and opinions. That is what this site is all about. Park Thoughts was designed to share opinions and perspective. And I do feel we have accomplished that. I agree with ya John, alpengeist is a much better ride than montu, I have been on both many times and alpengeist is just, well, better. Banshee at Kings Island will take the number one spot when it opens next year.